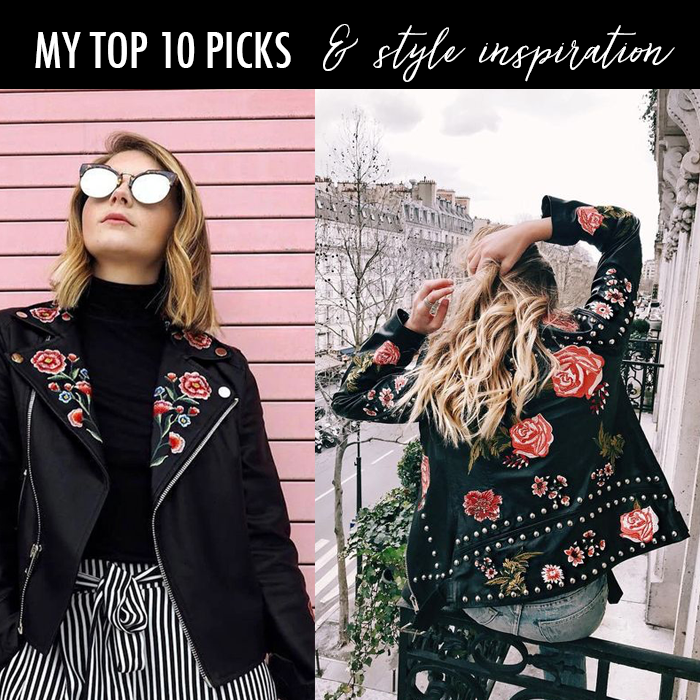 Embroidery is such a big trend right now - and these jackets reminds me of the BlankNYC one that is on sale right now at the Nordstrom Anniversary Sale. Also, below are a lot of great sales right now - with most of the items under $25. I am sorry - you are probably so tired of hearing about the Nordstrom Anniversary Sale by now - and there is still a week left. I will try to make this brie and quickly share thoughts on my top 5 hits and misses from the sale. Hopefully this will be helpful - to help you find something you haven't seen - or save you from buying something you might have to return. I love this leopard jacket. I already wore it. It looks with jeans - and a simple tee layered underneath. It has a bit of a sheen - but not too much. You can see how I styled it here. I bought this cardigan last year - and I love the updated one even more this year. I ordered it in the evergreen color (blueish-green color) - and already compliments. I just wish they had stocked more of them. There are still a few available - and for $32 - I highly recommend picking one up. I missed these boots online - but spotted them in the store. They look just like the Stuart Weitzman ones - but are a fraction of the cost. I love the chunky heel - and I can't wait until fall to wear them. For me it is a tie between this brand and this brand. If you are looking for a small travel set - I highly recommend this one. It smells so good - and honestly, it makes my hair so easy to style, plus silky smooth. I saw these boots on so many bloggers - and I thought I would love them, too; however, when I got them I was disappointed. I didn't love them as much, plus, I didn't think I have that big of calves - but the boots were too tight on my calf/knee area - so, they ended up going back. I love sweaters - and I thought this fun balloon sleeve sweater would be the perfect fall color - and I loved the color. But, when I tried it on - it was just "meh" - sort of blah. I didn't like the dropped shoulder, and it just looked like knit that would pile and look worn right away. I spotted this coat right away - and I ordered it. I even tried it on - in my try on session. I just could not get past that itchy part. It was just a little to scratchy feeling - and I thought that would bug me - so I did not keep it. I loved the color - and thought it would look so fun dressed up with jeans and t-neck sweater and my OTK boots. Again, I saw other bloggers feature this cardigan - so I got swept up and thought - I better buy it! But when I got it - it was just not me and overall big fitting. I wanted to love these shoes - because I really love leopard shoes. The inside of the shoe felt like it would rub my toes - and give me blisters, and for that reason I returned them. I like to wear flats to be comfortable - but these felt like they would cause trouble for me. 1. These raw hem jeans that are under $30. 2. My favorite utility blouse - in a fun floral print. 3. These chandelier statement earrings that are 50% off! 4. My favorite summer necklace - that I have worn a lot more than I thought I would and so glad I bought it. 5. This ruffled cardigan that would be perfect for fall - and is only $35. On Monday, The Blended Blog will be hosting a fashion link up - for all things NSALE - if you want to join. The Blended Blog - Be sure to stop by and link up your fashion posts. 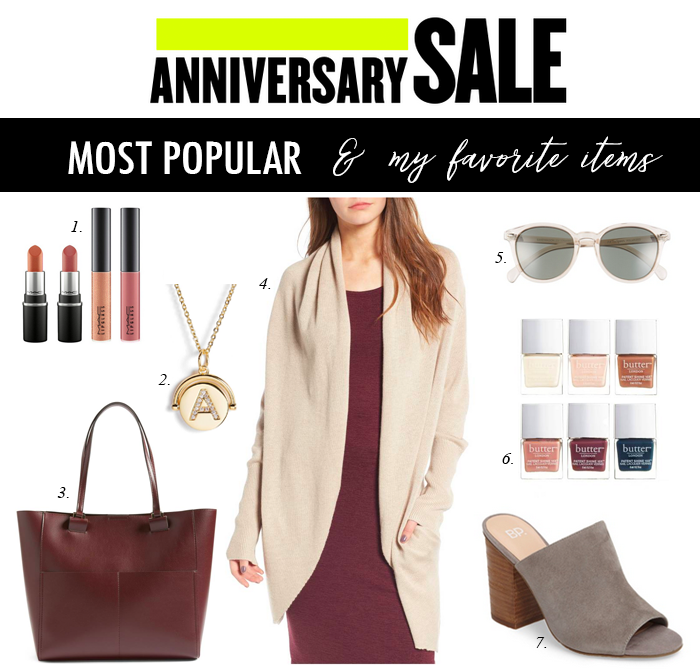 When I started looking through the Nordstrom Anniversary Sale items - I was surprised how many save vs. splurge items there were. I have picked out just a few of the really popular items - but there are even more! 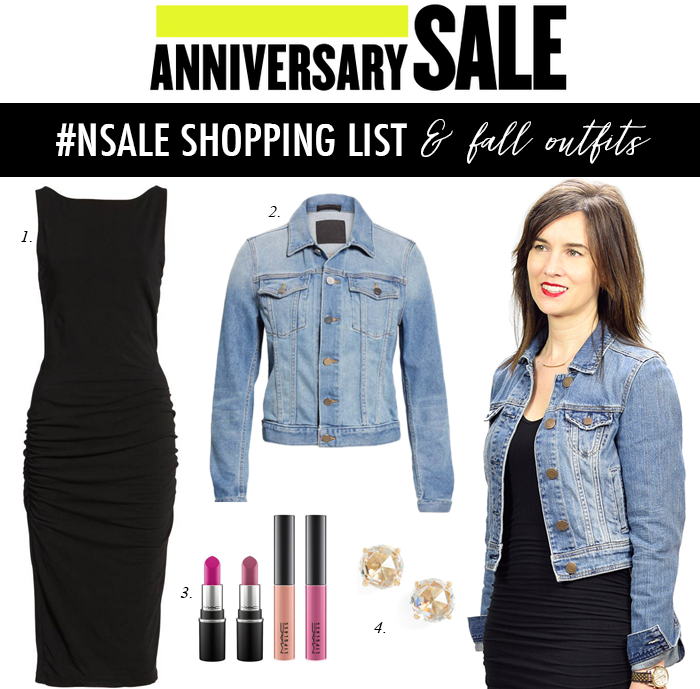 Also, you may remember that first dress from the #NSALE try on session I did a week ago. And, just in case you missed it - yesterday I shared six different fall outfits from the sale! I love my dark grey jeans - and these are on sale for $15. These fun brocade flats with a gold buckle are under $30! I love this sweater - I have it in three colors (I love it that much!) - and it is on sale for $15. It is one of those sweaters you can wash over and over - and it never shows wear. I cannot believe this draped (faux) leather jacket in this on trend fall color is still available in all sizes - and is under $30. This is the softest and my favorite tee - and I cannot believe it is still available in all sizes and colors. I cannot believe this beautiful burgundy lace top is still available in all sizes - and is a great price! These suede blush flats were so popular this spring - and now they are back for fall in cognac, red, and even the on trend blue. 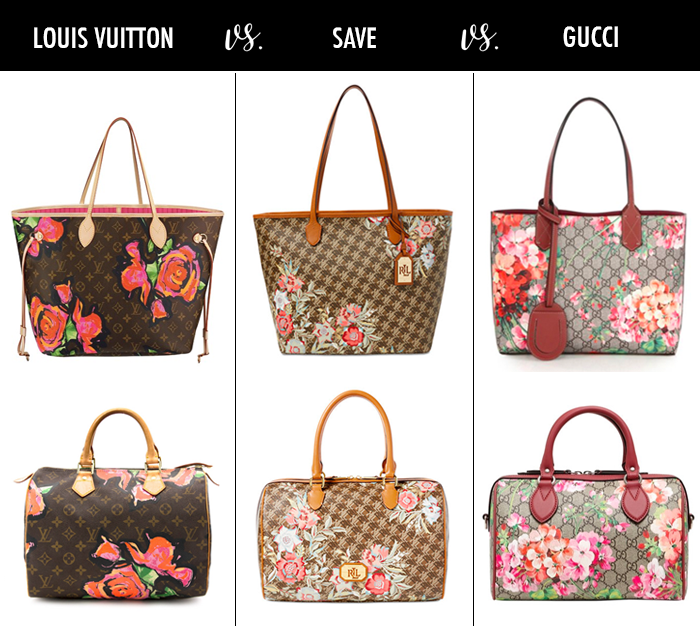 If you like save vs. splurge posts - I did this one with summer trends a few weeks ago. 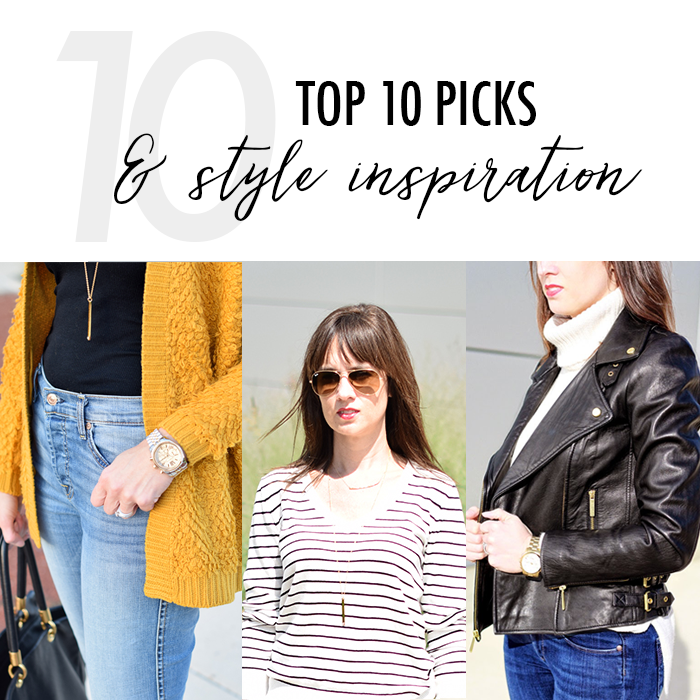 I am hosting today on The Blended Blog - Be sure to stop by and link up your fashion posts. 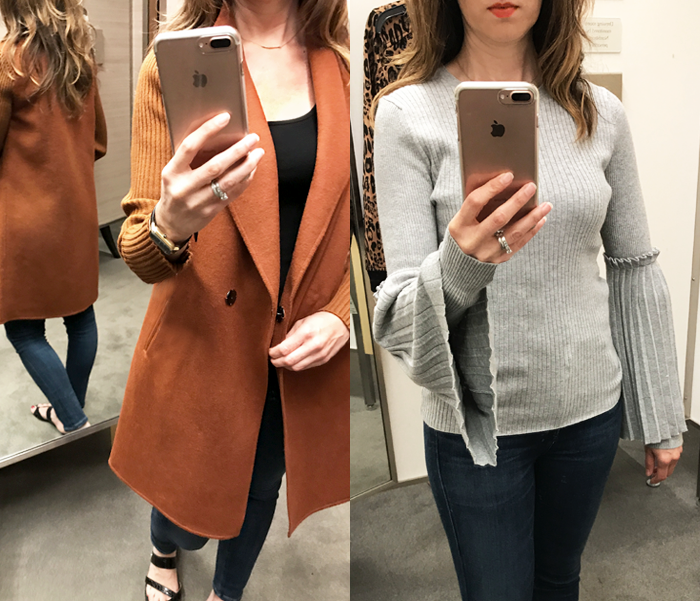 The Nordstrom Annivesary Sale is the perfect time to buy for fall - and here are six different fall outfit ideas - with items from #NSALE. 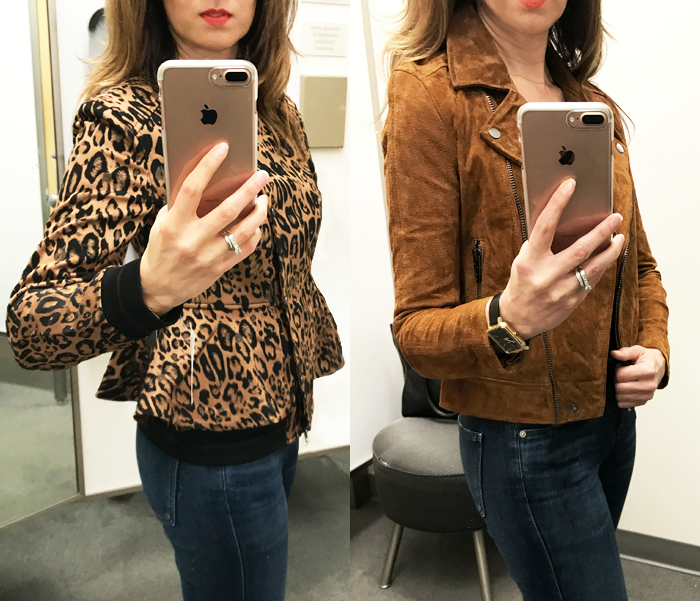 I think the moto jacket one may be my favorite - or maybe the leopard coat one. It is not surprising the leather jacket is my favorite - somehow over the last several years, I have collected over 15 leather jackets. And, that does not include the two leather jackets that are currently be used for as "fit" samples for my clothing design. (And, if you are wondering - I am on to my third (and hopefully final) prototype, and I should have something this late fall, early winter! You do not know how excited I am - it has taken sooooooooo much longer than expected!!! 1. These leopard booties (that also come in burgundy and other colors). 2. These brocade booties - that I think are going to be really popular. 3. This comfy textured cardigan that is under $60 (and NOT sold out!). 4. These brocade slides (and these snake print) slides. 5. This textured comfy sweatshirt sweater that comes in this chili pepper color, and blush, too. 6. This black and white plaid shirt that is only $18 and reminds me of the sold out NSALE one. A very similar red slide is for under $50 is part of the Anniversary Sale. 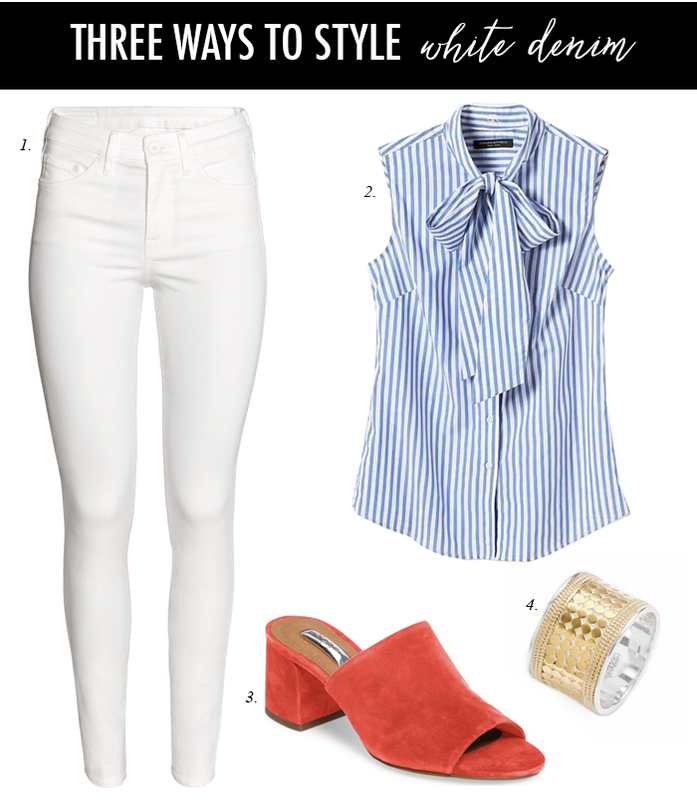 This fun striped bell sleeve blouse - available in all sizes. A peep toe bootie/sandal version that would be perfect for fall - and available in all sizes. A sleeveless sweater vest option that is under $50. This cute tie front top that is only $32. 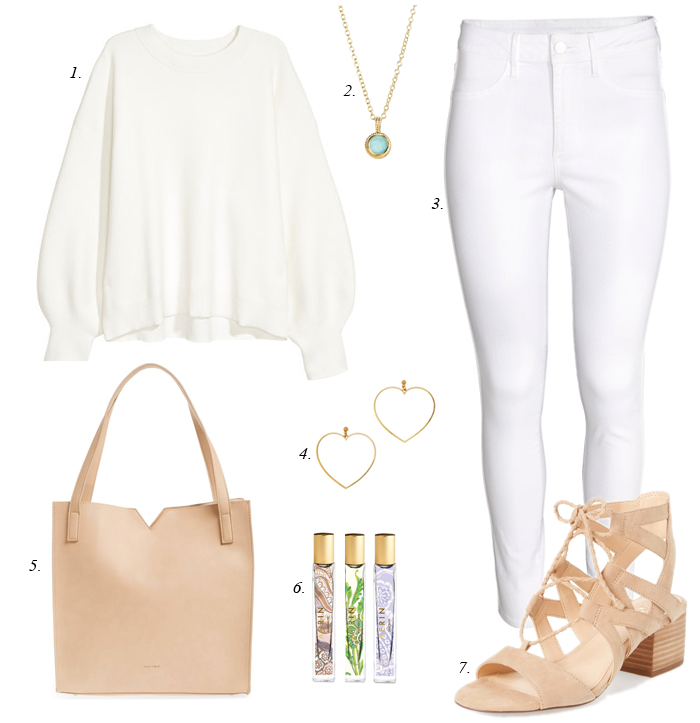 Above I am sharing three different ways to wear white jeans for summer. I love each of the looks. 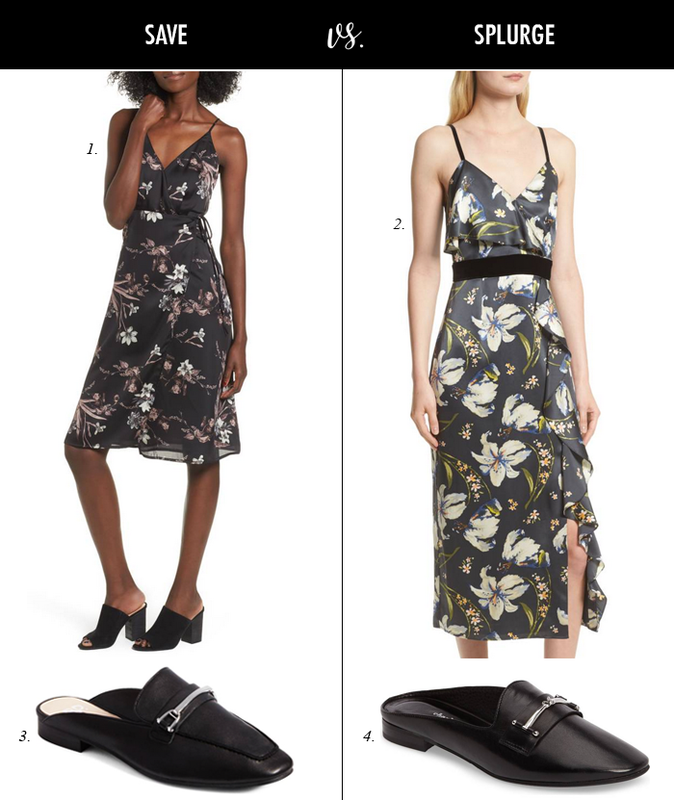 I have also included similar options from the Nordstrom Anniversary sale - and items that are still available. It seems like this year - items have sold out a lot more - and have not been re-stocked or been able to support the demand. Below, I am sharing five great NSALE itmes that are still available in most (if not all sizes) and are not sold out. 1. 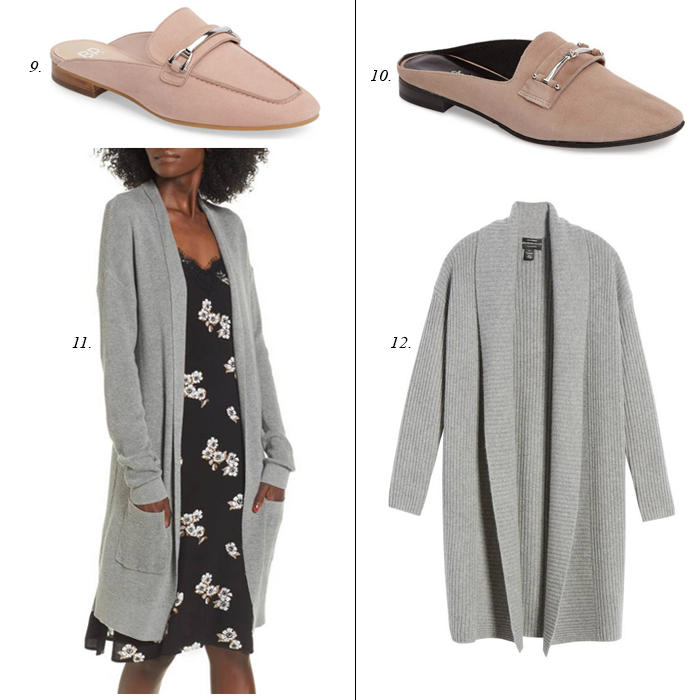 These slide loafers that come in three colors and are under $60. And, are still available in most sizes for a two of the colors. 2. I love wearing my short ankle booties - and these are still available in most sizes - and in three different colors. 3. This long cardigan (which happens to be a favorite of mine) is under $50 - and still have sizes available in 7 different colors. 4. These darker wash skinny jeans - perfect for fall and under $60 - and still available in all sizes. 5. These short ankle booties remind me a lot of the popular Jeffery Campbell ones - that someone complements me on each time I wear them - and these are only $69. Above are a few looks I have worn over the years with items I have bought at the NSALE. 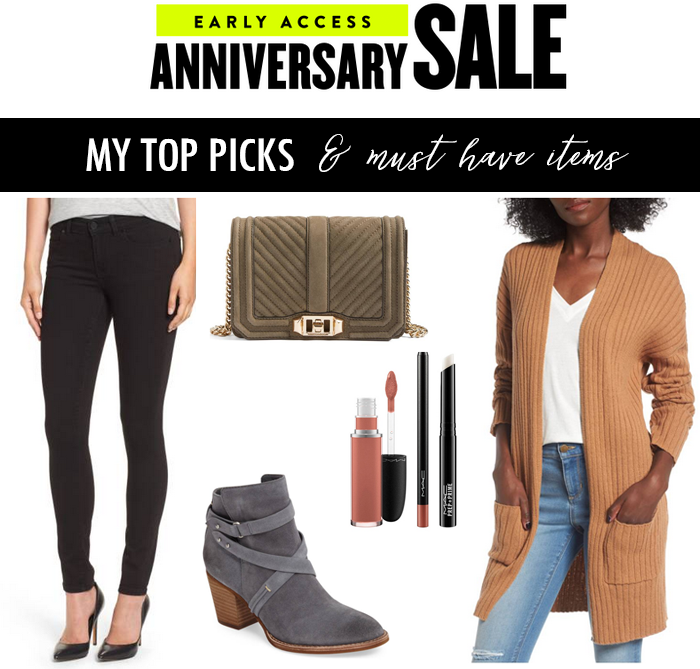 I have found similar items from this year's Nordstrom Anniversary Sale - this very similar moto jacket that is only $65 - and this striped tee that is under $20. 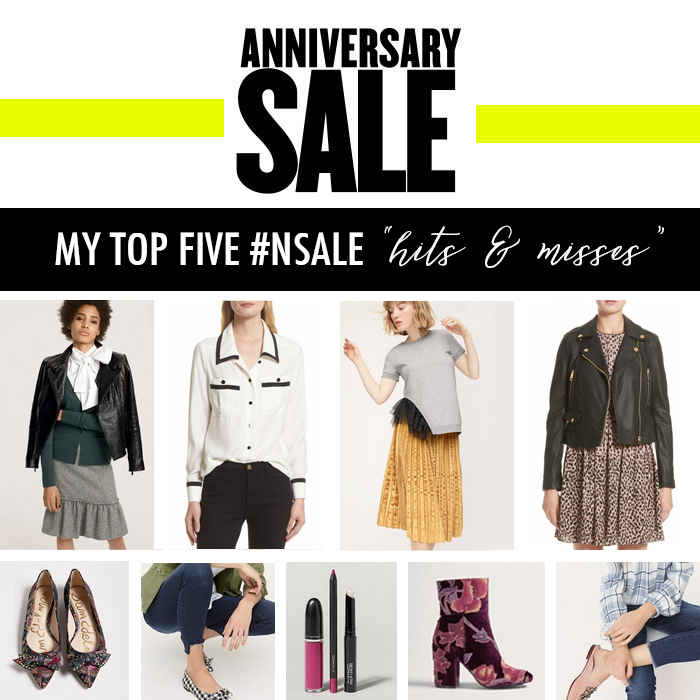 Below I am sharing more deals under $25 and $50 - and it is a mix of items from other stores, and a few #NSALE picks. This printed romper is only $10. It would look great with my mix & match 15 piece summer wardrobe. These are the softest basic tees (that are a little longer - more tunic style) - and under $25. I bought this sweater - and love it - and it is only $12 on sale. These tops are the perfect summer color - and are on sale for under $50. 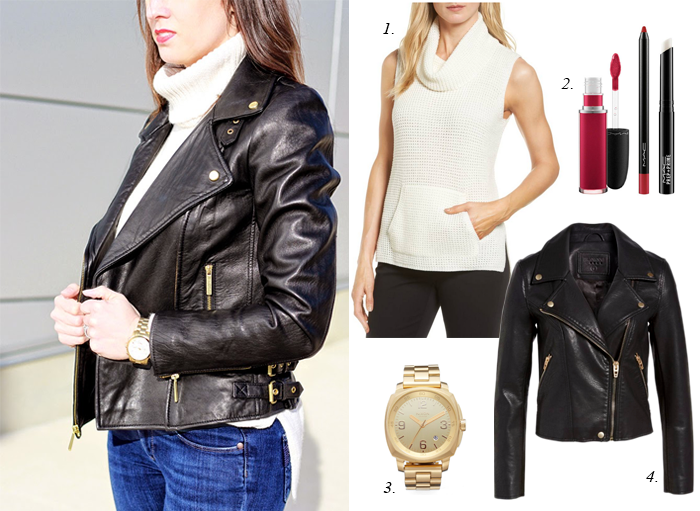 This draped front jacket that is (faux) leather is only $29! My favorite necklace brand - has so many necklaces on sale to pick from starting under $30. 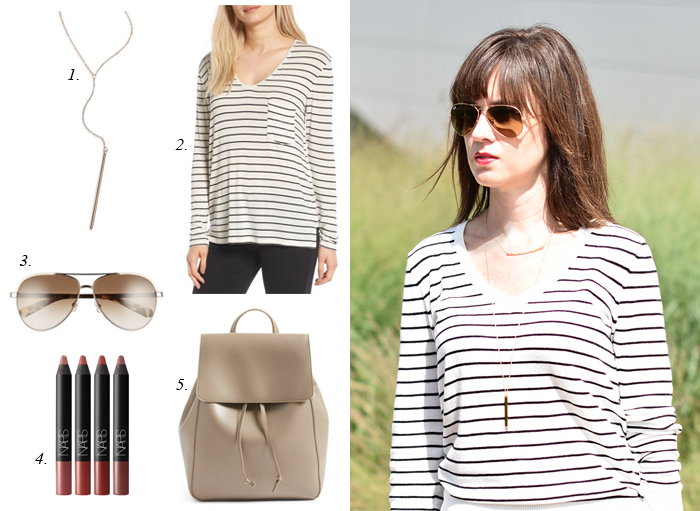 A striped shirt is very classic - and this one is only $25. 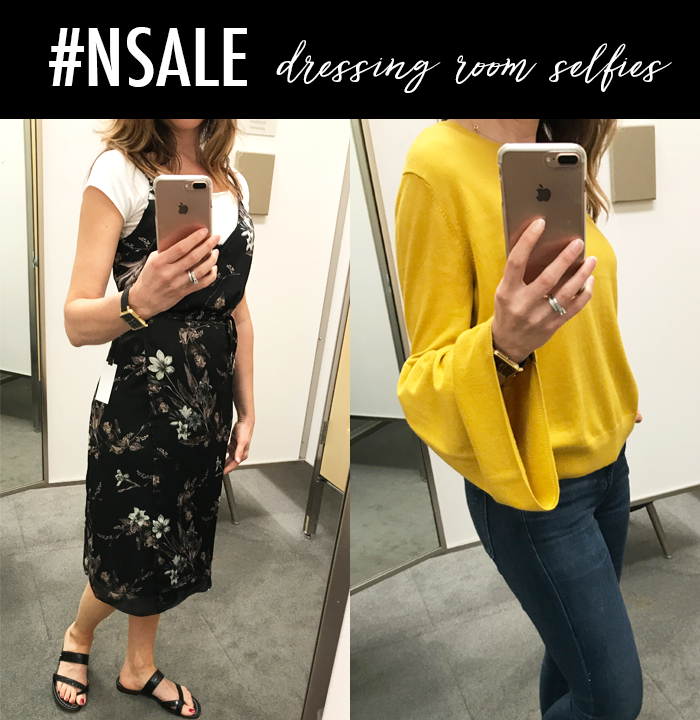 The biggest sale of the year the Nordstrom Anniversary Sale 2017 is now open to the public! If you have been waiting to shop the sale - the wait is over. Above I have shared a few items from the - and below are the most popular items - and my favorite purchases so far. 1. This long ribbed cardigan - perfect for fall (and layering for cool summer days). 2. These suede ankle booties - that come in three different colors. 3. This v-neck pullover sweater that is under $25. 4. My favorite cardigan from last year - that got even better this year - and is only $32! 5. 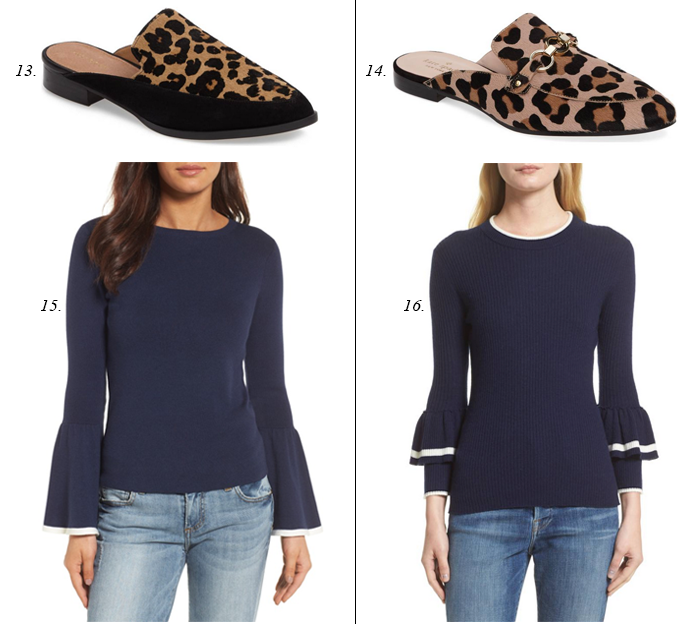 This bell sleeve sweater that is a fun twist on the usual bell sleeve. 1. 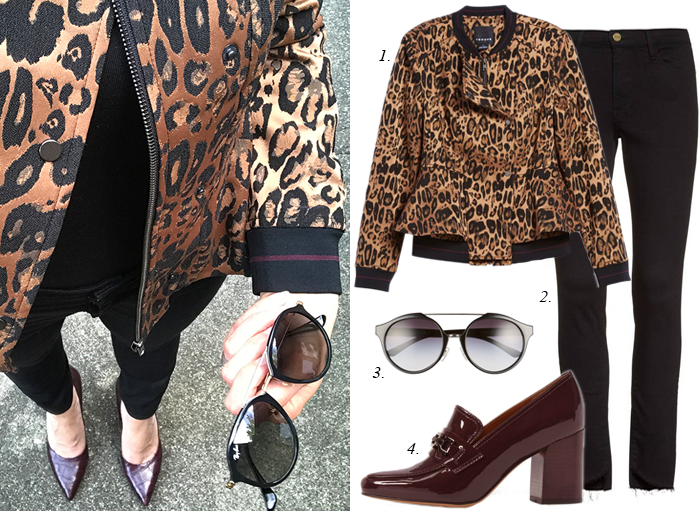 This leopard jacket - I shared a picture of how I wore it to work the other day. 2. I missed these over the knee boots online - but spotted them in the store - and I love them! There were very similar boots last year - but these are much better in my opinion. I think I overlooked them because I did not like the ones last year. 4. I can't decide - but I think this sweater is the winner - and keeper. 5. And, lastly, my favorite staple tee that I stock up on each year. 6. Lastly, a miss - I wanted to love these boots - but they did not work for me. It has been a few months since I put together a mixable wardrobe. The last one I did was one of my favorites with blush/pink colors. 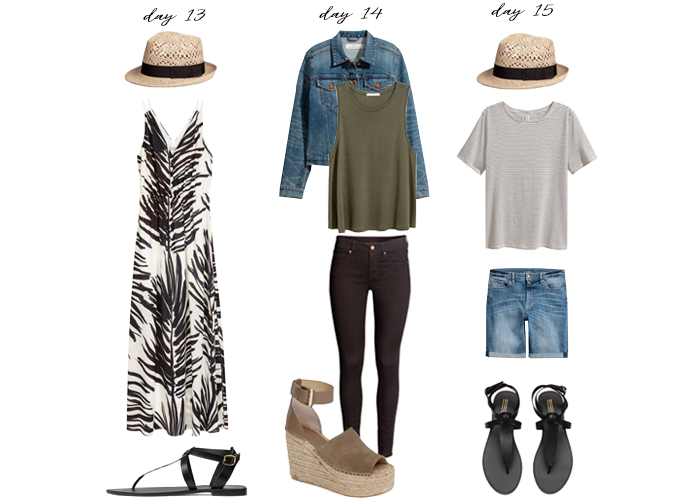 I tried to keep this one more neutral with summer khaki, whites, and black with a few prints. 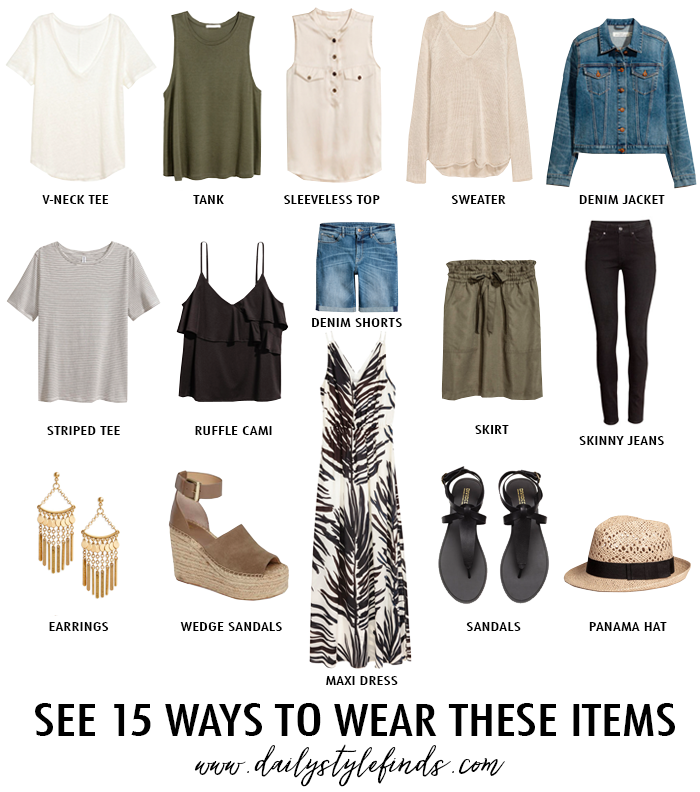 In doing this - it really shows that with only 15 items - you can create 15 different looks. 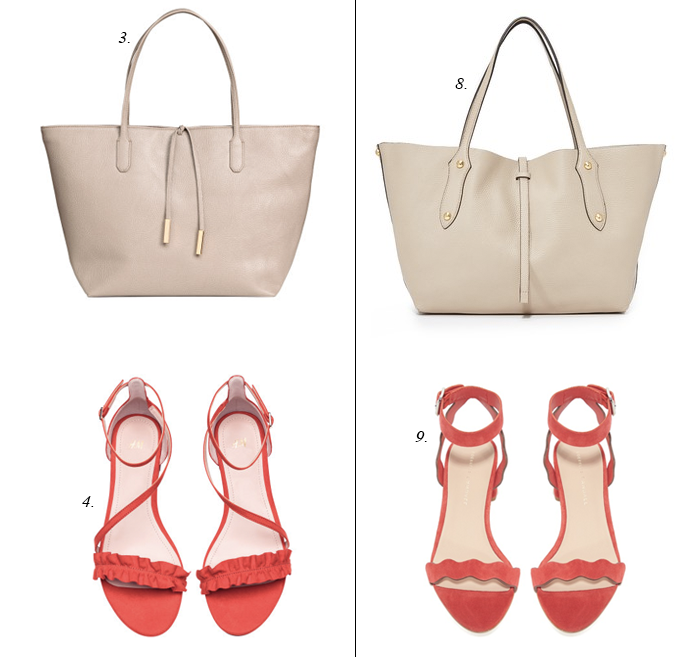 And, all these pieces are budget items - except for the wedges. The chandelier earrings are marked down to $20, the ruffled cami is only $10 (and comes in other colors), my favorite sweater - is marked down to $15 (and comes in three other colors). 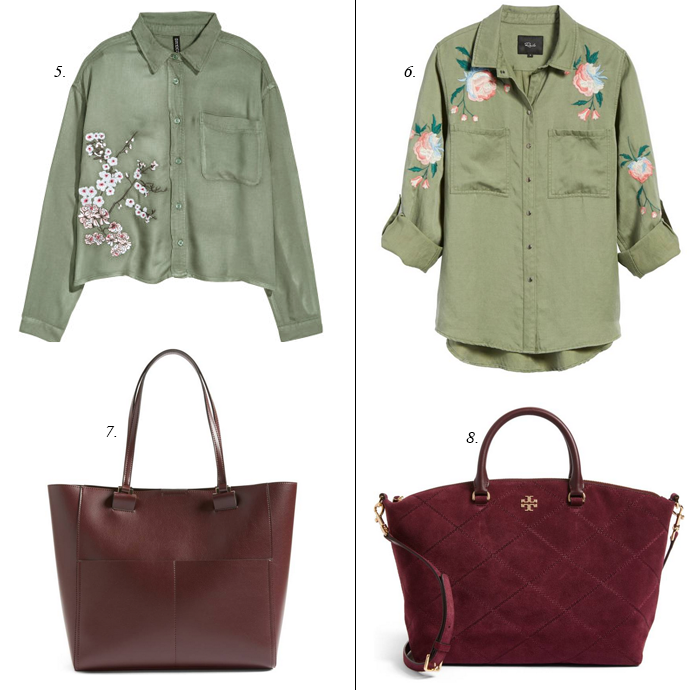 Since this is a long post - don't miss my top 10 new arrival and sale picks at the end of the post. These stepped hem jeans have been very popular - and I found this pair for a fraction of the cost. I bought this necklace - and love how transitional it is - and it is on sale for as low as $15. These mules are only $18 - and come in three colors. This popular v-neck tee is marked down to $20 in some of the colors. I also like these gold mules that are under $25. I like this striped cardigan - that mixes camel and blue with black. It is also up to 50% off. This is my favorite blouse - and this print would be stunning - and it is up to 50% off right now. This striped sweater is on sale for under $30. I bought this necklace in blush/pink for summer - and I might buy this one, too. These leopard slides are under $50. I have tried all the popular mascaras - and this one is still my favorite. I do not typically wear dresses, but I saw this floral wrap dress that is under $50 - and I thought I would try it on. I layered it over a white tee - but you could wear it without the tee. My sandals are not part of the sale - but they are marked down under $50 - and they are probably the most comfortable sandals I have ever bought. My mom just got a pair, as well, and she loves them just as much. Just in case you are wondering - my watch is from last year's anniversary sale. Fit of Dress: It was a mix - but I would probably size up - and layer a tee under it (or t-neck and tall boots - for fall). I picked this sweater as one of my top picks the first day of the sale - and when I tried it on in the store, I was glad I picked it. It is a lightweight sweater - that comes in the most perfect mustard color that could be worn this fall with boots - and it is only $32. It also comes in grey and off white. Fit of Sweater: True to size. 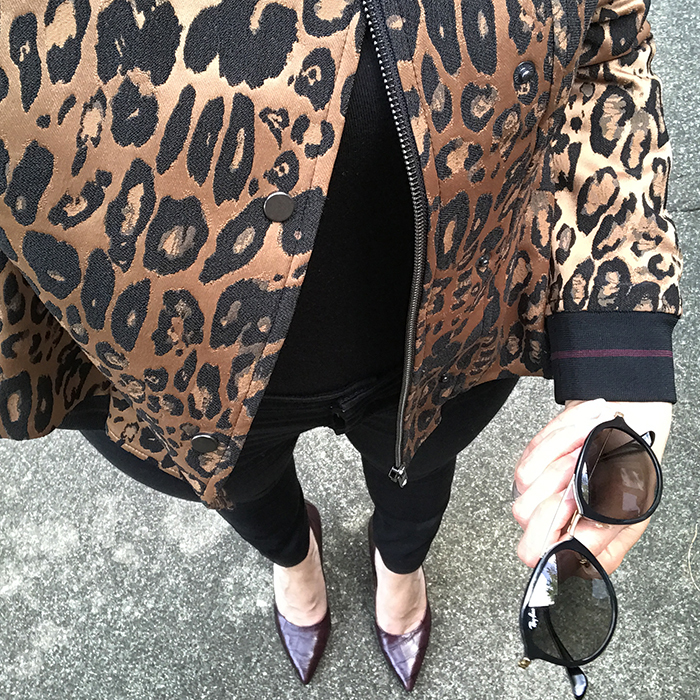 I love leopard print - and when I saw this jacket I was a little undecided about how I felt about it, but once I tried it one - I loved it. The peplum detail around the waist is so fun - and it looks great paired with a black tank and jeans - and some burgundy pumps (that is how I wore it to work yesterday). It is hard to see in the picture but it has an athletic-type banding around each opening - which gives it a sporty influence. I highly recommend checking out this jacket. Fit of Jacket: True to size. If you want to layer a sweater under it or long sleeved top, I might size up. I love short leather and suede jackets. This suede jacket is pretty much last year’s wildly popular suede jacket but without the belt. I actually prefer it without the belt - it makes it much easier to wear. It comes in this great spice color, as well as grey and red. Fit of Jacket: I sized up - just to have room to wear a sweater underneath. I saw this sweater coat in the catalog before the sale - and was one of the items I was most excited about. I love the knit arms with the wool body. In person, I loved the color and the fit of the coat. I do have to mention that it was a little itchy for me - but with a long sleeve top underneath - that might fix the problem. Fit of Coat: A little big. I would recommend sizing down. This updated bell sleeve sweater is a favorite of mine. When I tried it on - my mom said - now that is you. I love the pleating detail on the sleeves. It also comes in navy and burgundy, and hopefully they will re-stock the blush color, which was my favorite. There is also a dress version - that would be so fun this fall with boots. Fit of Sweater: A little loose in my typical size. I know you have probably been overwhelmed with everything Nordstrom Sale - but if you do not have a card - you can still see the items - and add them to your "Wish List" - so you are ready for public access which starts this Friday. 1. This brand has become a favorite of mine - and this lip kit is a great way to get everything for a lower price. Also, I want to try this prep product that is supposed to help stop the lipstick feathering. 2. This is my other favorite lipstick brand of mine - and you can get a four lipstick set for a $50 savings. 3. I absolutely love this shampoo & conditioner - this combo set with the texturizing spray is under $40! 4. This shampoo/conditioner just smells like the beach to me - and makes my hair so soft. It is a great bargain - and highly recommend picking it up now. 5. I have thought about buying this - because everyone seems to swear by how good it works. It is $40 off right now - I am thinking about it. More Sale - my picks, what I bought, and deals under $25. 1. This maxi dress with playful pom pom ties is on sale for under $30. 2. This chambray dress with tasseled ties and ruffled sleeves is only $25. 3. This chunky sweater is the perfect summer sweater - and comes in two great colors. 4. This camo print cardigan is only $18 - and so much fun - and would look great paired with black and blush. 5. This twist front tee that comes in six colors is only $22. 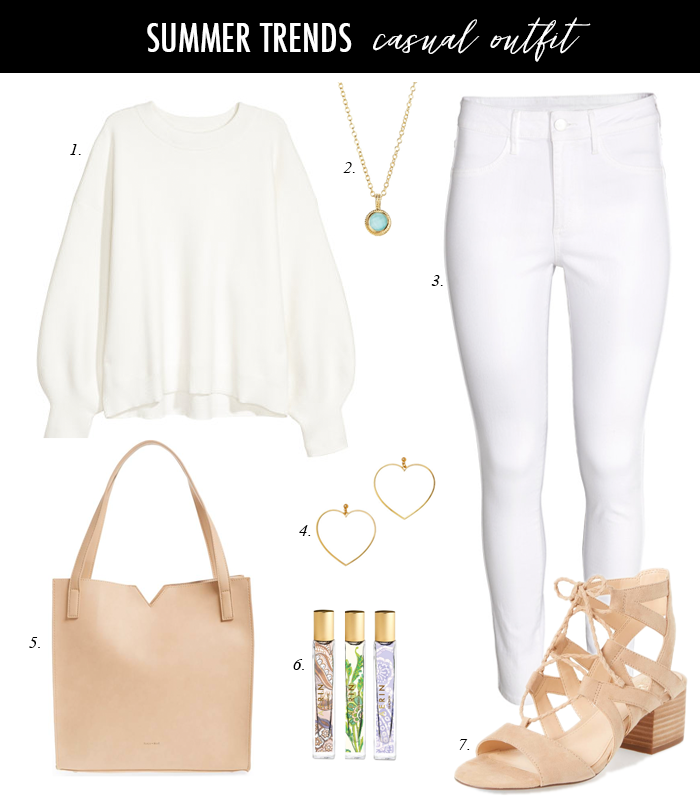 This classic all white look is something I would wear. I just need to get more comfortable wearing white jeans. I feel so self-conscious wearing them. If they are tight enough that they are not bagging - then, they feel just a little too skin tight. This black ribbed dress is only $4! This perfect summer blazer is on sale for $35 - and comes in two colors. These gray jeans are only $10 - and come in other colors. This new arrival cardigan is only $13 - and comes in five different colors. This relaxed summer sweater that reminds me a lot of the popular Free People one - is on sale for only $17. This popular tie front sweater is great deal. This plaid scarf for fall is only $16. This tie front blouse - that comes in three colors - and is only $32. I love my black skinny jeans - and these are under $40. Just in case you missed it - my picks, what I bought, and deals under $25. Today, I am sharing five summer recipes that quick, easy, and healthy - except for maybe the molten chocolate cake - but since it is so good (and easy to make) I had to share it - on The Blended Blog! 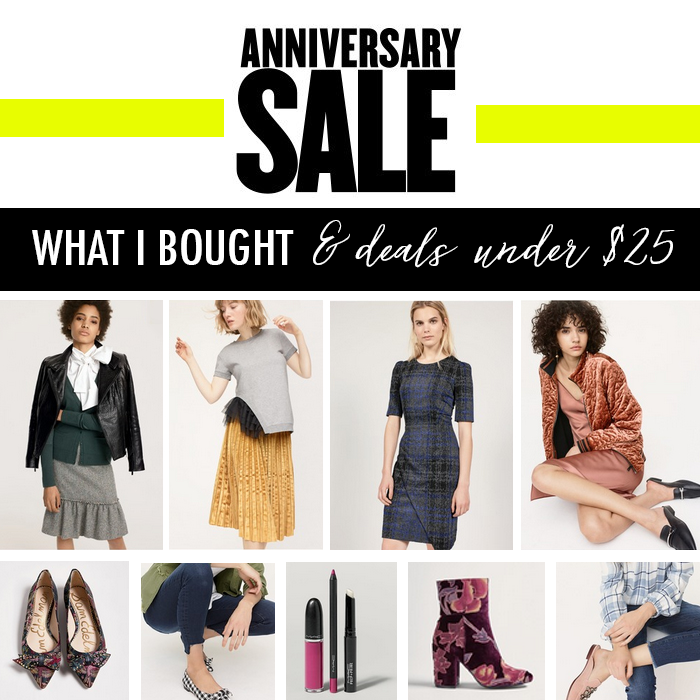 I love the Nordstrom Anniversary Sale - and I think this has been one of my favorite sales so far - you can check-out my picks, what I bought, and deals under $25. But, today, I thought I would share some other great deals from stores other than Nordstrom. 1. This suede moto jacket is on sale for under $35 - would be perfect now and for fall. 2. 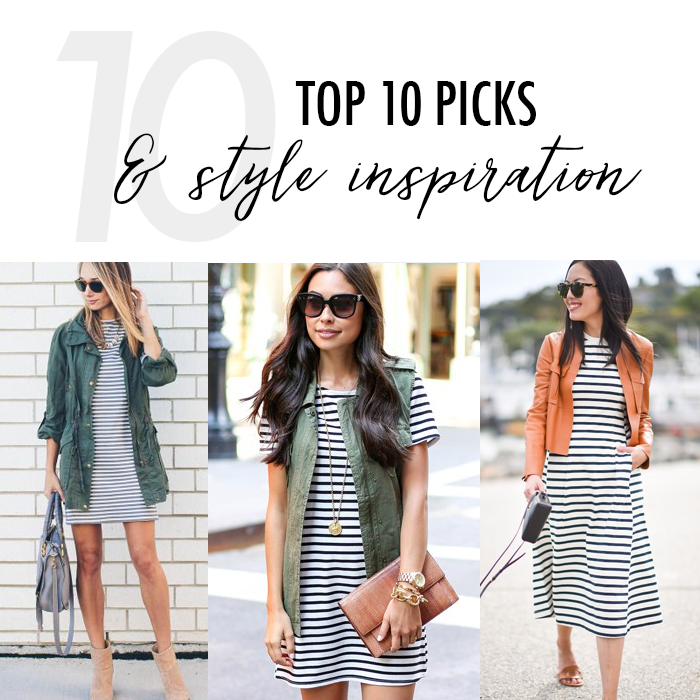 This striped dress is only $18 - and would look cute layered with this cargo vest. 3. This fun balloon sleeved sweatshirt sweater is 40% off - and comes in two great colors. 4. This palm print maxi skirt is only $18 and it also comes in animal print. 5. This jersey dress with a draw string waist is only $10 - it comes in gray, black and stripes. 6. These cardigans are one of my favorites - and I love this striped version that is 40% off. 7. This cute striped wrap dress is 40% off. 8. This sleeveless satin blouse is only $10. 9. This cocoon cardigan is only $20 - and comes in three colors. 10. This shift dress is 40% off and comes in the best colors.